A landing page is the single page website where the user lands on, as a result of some search done on search engine or an online campaign. Only the useful information is displayed and a call to action is required from the visitor’s end. In online marketing, and according to Wikipedia, a landing page, sometimes known as a “lead capture page” or a “lander”, is a single web page that appears in response to clicking on a search engine optimized search result or an online advertisement. The landing page will usually display directed sales copy that is a logical extension of the advertisement, search result or link. Landing pages are often linked to from social media, email campaigns or search engine marketing campaigns in order to enhance the effectiveness of the advertisements. The general goal of a landing page is to convert site visitors into sales or leads. Click Through Landing Page: These are the warm up pages which means it provides all the information the visitor needs to know before arriving at the final step of purchasing. Instead of asking the user to sign up or enter some personal information, it is better to build a rapport in the first place. Lead Generation Page: Lead generation pages are created from sales point of view. The purpose to create a lead generation page is to capture a user’s details such as email address, name, mobile number etc. For this you would need to give something in return. For example, you can provide an eBook or a newsletter when a user fills out the details in the form. Landing has the best features anyone can ask for to have on the landing page. With parallax effect and full screen media, Landing theme help you with innumerable drag and drop options in the layout builder. Are you not a tech-savy? Don’t worry, it provides you with a number of the already built templates to choose from. 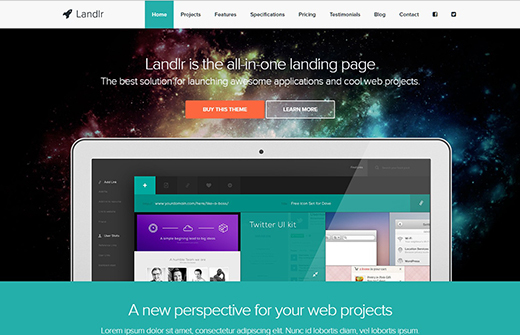 Landlr is yet again another best landing page WordPress theme. With its bright flat design, Landlr provides a set of animations which play gradually with the scrolling of the page. It has a built-in slider plugin that can be used to beautify your landing page. All you need to do is create the sections and add the relevant content using the drag and drop options. 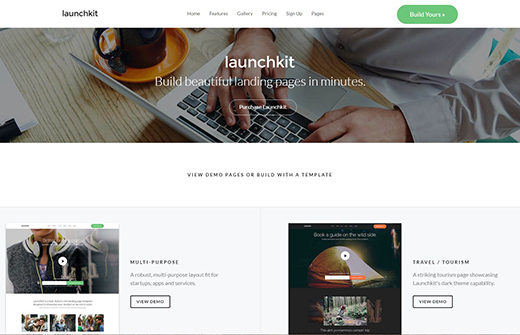 If you are planning your own start up then LaunchKit is the right fit for your landing page. It provides you with a variety of customizable page builder elements. You can play with the color schemes and fonts in whichever manner you want to. It has unlimited layout options to make your task much simpler. It gets even better when you know that LaunchKit is SEO ready. Adding to the list of its features, it has parallax effect, WPML plugin that helps in translating the content. 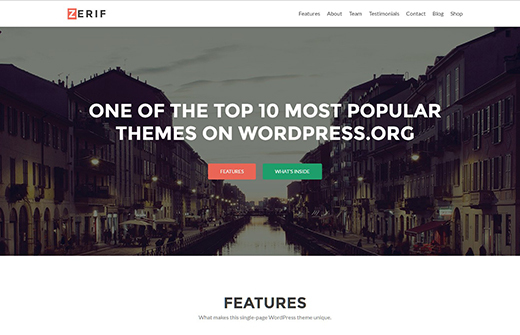 Fusion theme gives your landing page an elegant and professional look. It has everything you need to use for the landing page, starting with many customizable options you can also write your code using the shortcode builder. It is a CSS perfect theme and you would need to put in very little effort with the user experience. 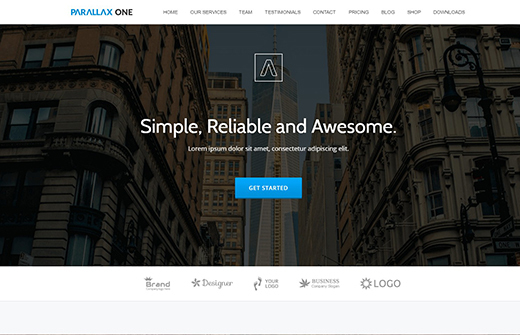 Parallax One is the best among the free WordPress themes. Justifying the name, it has the effect of parallax. It emphasizes on the content mainly and rest comes along the way. It is a responsive theme with a shop section in it. Zerif Lite is a big yes for the creative agencies. The theme features of Zerif Lite include easy editing of the code, cross-browser compatibility and easy translation of the content. Being a non-technical person, you do not need to worry about all the customization. 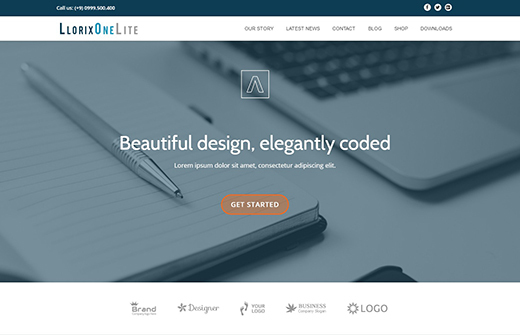 Llorix One Liteis a simple and professional theme for the start ups or small scale business website. It has a parallax effect with customizable text options. 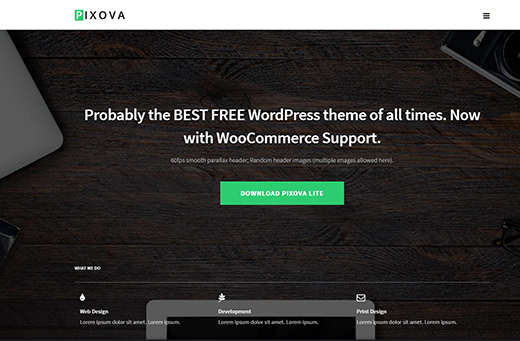 Pixova Lite is the best free WordPress theme for your landing page. It is a responsive and retina ready theme with the cross browser compatibility. It offers Woocommerce support and has the translation feature too. 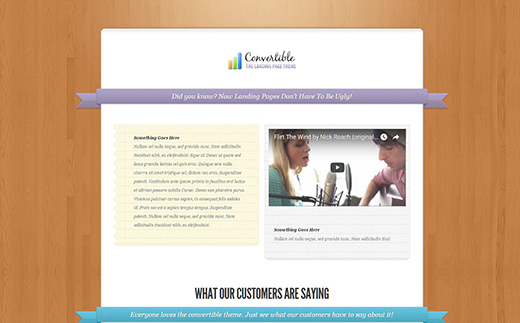 Convertible is yet another popular landing page WordPress theme that is developed and launched by Elegant Themes. The theme comes with single page layout that vertically scrolls without interrupting users and navigating them away from your sales message. Convertible WordPress theme also features a drag and drop page builder, making it extremely easy for non-technical webmasters to create pages without having to mess around with the code. Additional features include video embedding, testimonials, quotes, ribbon header, image sliders, buttons, lists and so much more. 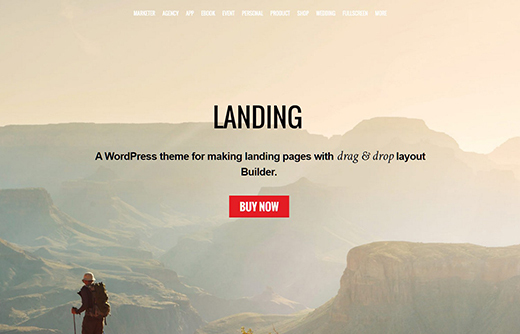 In this post I listed the 9 Best Landing Page WordPress Themes for 2016. By now you might have made the right choice for your landing page. If not, you can compare all of the above themes and then make your decision. Rachael is a freelance blogger, associated with Essay-On-Time. She writes about technology and mobile development. I love the first two plugin that are described in the article. I definitely gonna buy the first one for my blog. Thanks for sharing such a great article! 58 queries in 0.367 seconds.